My family is a stickler for routine, especially when it comes to dining out. As much as I love to be a culinary explorer, there’s something so comforting about knowing exactly what you’re going to get. For our family get-togethers we eat at the same 3-4 restaurants over and over again, which is fine with me because it means I get to have these “standard” favorites around twice a year. The places that have made it onto our rotation all have one thing in common, and that is the food is consistently delicious. For almost 20 years, the Kirin Chinese restaurant has been one of my family’s favorites and we order the same 7 dishes each time, (although recently crab has become a staple which pleases me so much). But this post isn’t so much about my family’s 7 standard dishes, but more about the 1 crap-shoot dish we know of as Ebi Chili. As I am the order-er for the table when we go for Chinese, I can fire off our order to the server pretty fast… until I get to our 1 elusive dish. We’ve never been sure what it’s called in Chinese, but we know that 75% of the time we end up with the dish we’re meaning to get. It’s actually very comedic because up until recently, I could never find it on the menu, and I would describe it to the server as, “prawns, with a tomato-ey ketchup sauce, with garlic and ginger and onion”. Most times I get a blank stare… The language barrier is usually a bit of an issue during these exchanges. It also doesn’t help that my dad is beside me interrupting saying, “Ebi Chili, ebi chili, you know… ebi chili”. Still more confusion by the server. My dad then looks around to see if we can get the manager, because most of the time he knows what we’re talking about. My dad points to the manager, asking “Ebi Chili?”. My brother rolls his eyes, knowing that Ebi Chili is how it’s referred to in Japanese, and this is a Chinese restaurant after all and how would they know what we were talking about. Like I mentioned before, 75% of the time we’d get the right dish, and funny enough when it’s not right we’ve never gotten the same dish twice. 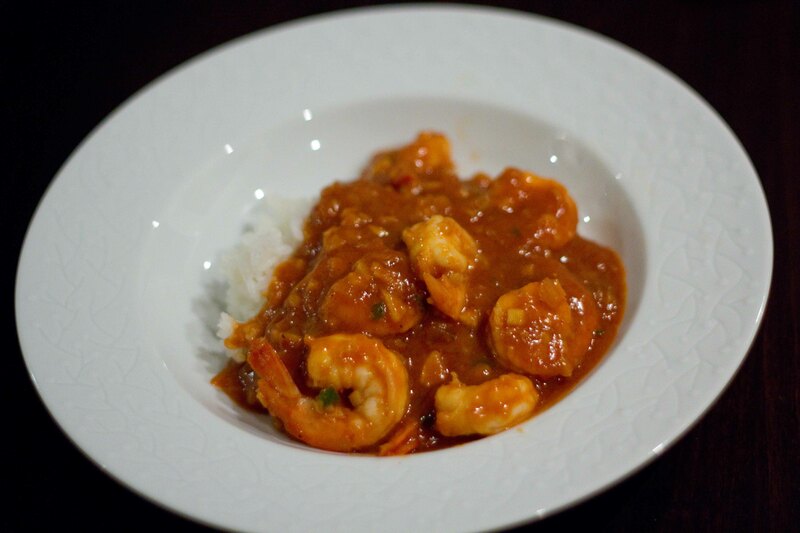 Because ebi chili is one of my favorite dishes, and because I was never sure I was going to end up with it, I decided that I should learn how to make it. It’s only been recently, (thanks to the other food blogs) where I’ve been able to get really close to the taste I’m trying to achieve. It’s not “perfect” yet, but pretty darn close and so quick and easy that I have to share the recipe. After a few minutes, add the prawns and heat until pink on both sides, (a minute or so a side). Add sauce and simmer away until it thickens. Serve over rice for a fast and delicious weeknight dinner.